On the 23 October '08 you suspended my website as it was considered by the 'Abuse Support Team' to have 'defamatory' content. I asked in several e-mails for details of the offending parts/page of my website that you considered 'defamatory' but you refused to give any information and gave no reason(s) why information was withheld. Owing to the fact you are making it impossible for me to make my website active you are forcing me to close my account with Fasthosts. Under the Freedom of Information Act I request all information/data that concerns the allegations made and the source (names) of these allegations. Please find enclosed my cheque for £10 as requested. Under Article 10 of the European Convention on Human Rights. You have the right to freedom of speech or expression and to voice your complaint! Are you in violation of 'Article 10 of the European Convention' by preventing me my "freedom of speech or expression"? I believe it is for the person(s) I am defaming to take High Court action against me not for a 'third party' to consider themselves as Judge and Jury and take action against me. As I understand the Internet is, amongst other things, a news/information media, all I have done is give a true and honest account of my dealings with members of the Law Society which I religiously backed up with evidence. I did ask you several times to make known to me what you considered 'defamatory' but you refused to give me any information. 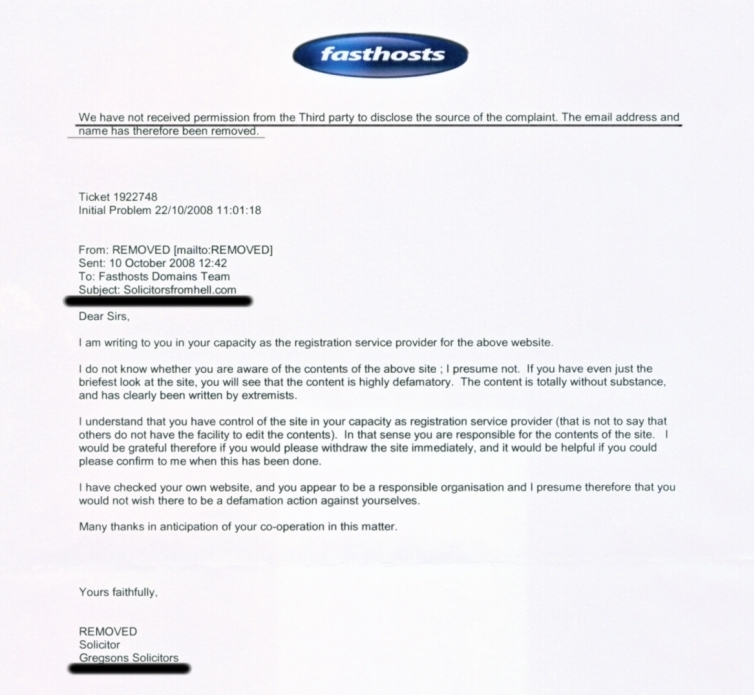 As Fasthosts allow the public to use their web hosting service it would be reasonable to expect they have a 'Duty of Care' to their clients and treat them fair and equal to all others irrespective of who or what status/gender/race or creed is involved. Let me quote the 'Magna Carta' "No one was to be condemned on rumour or suspicion, but only on the evidence of credible witnesses" now let me quote the law "When a public body is investigating a complaint all evidence must be available for all concerned". Not only have you carried out a complaint against me by a third party and found me guilty but you are making me pay £10.00 under the 'Freedom of Information Acts' to be able to see 'all available evidence' and find out the identity of the 'third party' who is making the complaint against me.